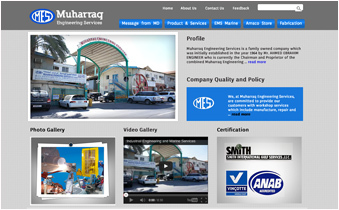 Muharraq Engineering Services website is up on the new eBuilder CMS. Muharraq Engineering Services a leading and one of the first Engineering service company in the Kingdom of Bahrain, provides workshop services which include manufacture, repair and maintenance of parts, accessories and tools according to their specifications and complying with the applicable legal requirements. Stays ahead in quality of services performed, MES have implemented the Quality Management System which complies with the requirements of ISO 9001:2008 Standard and API Spec Q1 and provide the basis for achieving the company Quality Objectives.